Very easy to talk to and listened to all of my concerns! Made an uncomfortable situation as comfortable as possible! I couldn’t have asked for more. It was just what I needed and Elizabeth was professional, helpful, warm and patient withall my questions. I couldn’t have asked for more. It was just what I needed and Elizabeth was professional, helpful, warm and patient with all my questions. 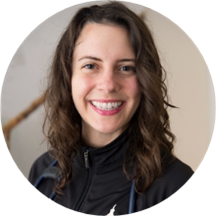 Elizabeth Prevou is a concerned and considerate physician assistant serving the community of Washington, DC. Ms. Prevou attended George Washington University, where she earned her dual masters in physician assistant studies and public health. She completed her bachelors at American University. Ms. Prevou is a part of Metro IPC/Cleveland Park. She is involved in the local Washington community through Cherry Blossom Run, Army 10-miler, Susan Komen Race for Cure. Ms. Prevou gives each patient her focused attention, and she prides herself on delivering the best treatment available. She is committed to helping her patients enjoy a healthier lifestyle. She works with each one to discuss ways they can make better choices for their health. I appreciate how kind and professional she was. Also, she is very knowledgable about my concerns and was able to offer reassurance. Plain language and matter of fact. Everyone was very professional. I didn't feel rushed as I have been with other doctors. She solved my problem and, except for the outrageous price for the ear drops (which she has no control over and they're working, so who am I to complain), everything seems to be going swimmingly. Don’t bother making an appointment, you will still wait two hours for absolutely perfunctory service. The doctor doesn’t exactly spend a huge amount of time with you so it’s a whole-office inefficiency. Elizabeth is the sweetest thing ever! She’s honestly so sweet and lovely! Definitely recommend. Very kind (as was the entire staff) and thorough. The visit was quick and easy. All of my questions were answered. I will go back when needed. Staff were courteous and attentive. Elizabeth was professional, took time to listen, and followed up with results in a timely manner. Elizabeth was very personable and knowledgeable. Awesome bedside manner. I felt like she listened to my concerns but was also extremely efficient. I appreciate that I didn’t have to spend the entire morning at my appointment. I would definitely recommend her! Well I wasn’t terribly pleased with the front desk or the individual who took my vitals, Elizabeth more than made up for that with her fantastic bedside manner. She was responsive to all my questions as well. I would recommend her. Excellent experience and prompt course of action prescribed. I was very impressed that I was seen right away and my problems were addressed quickly and a diagnosis was forthcoming along with prescriptions and request to return in a week. Elizabeth was one of the best providers I have ever seen. She was well-mannered and professional: she introduced herself and was a good listener. She seemed to really care about me. She did a thorough job of examining me & Shefulfilled my needs in terms of prescribing treatments and prescriptions. She went above and beyond: She followed up with me by phone twice! Once to give me advice on a physician referral to see a specialist for my GERD. Another time, to provide my lab results. I was so impressed, that I shared my experience with friends. She was great! Super attentive, listened to what I had to say and what I thought was best, and verified and supplemented that. She didn't dumb things down for me or act condescending. The location of the clinic is right nextto the Cleveland Park metro station which is super convenient as well. Given that I had an appointment, the wait time was unacceptably long!!! The care was great. Ms. Prevou was very professional and attentive. All the staff were courteous, helpful and empathetic. I liked the treatment I received and enjoyed meeting Dr. Prevou. I was highly impressed with the way the clinic was run. Elizabeth was wonderful. I highly recommend her. She was very personable and professional. She gave me great advice about what I needed to do. Had a great experience from start to finish at Metro Immediate and Primary Care. Elizabeth had excellent bedside manner and clinical knowledge. Appreciate her help! I had a terrific experience with Elizabeth. She really took the time to listen and was really thorough. She has a wonderful bedside manner and really seems focused on treating the whole person. She gave me lots of resources for continuingtreatment and healthy practices, and I'll be back to see her in the future! Good experience...much better than most urgent care places I've visited! She was very nice and answered my questions thoroughly. I didn't feel rushed during my appointment.